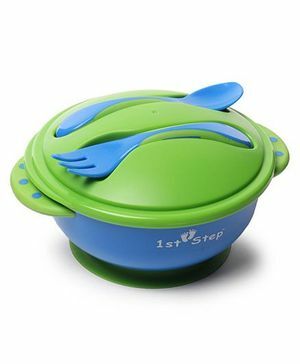 This 1st step feeding bowel set ideal for your child's feeds. It's unique lids holds the fork and spoon, intact to avoid misplacement. This bowl is just the right size to hold your child's meal. It has design of round shape in the exterior. It will be a favourite part of mealtime. Make your kids meal a lot more fun with this beautifully designed bowl. Perfect for kids at home or on picnics. Let them choose from their favourite shape and eat their hearts out.